1Genomic Medicine Institute, Lerner Research Institute, Cleveland Clinic, Cleveland, Ohio, USA. 2Lee Kong Chian School of Medicine, Nanyang Technological University, Singapore. 3Cancer Genetics Service, Division of Medical Oncology, National Cancer Centre, Singapore. 4Oncology Academic Program, Duke-NUS Graduate Medical School, Singapore. 5Taussig Cancer Institute, Cleveland Clinic, Cleveland, Ohio, USA. 6Department of Genetics and Genome Sciences, Case Western Reserve University School of Medicine, Cleveland, Ohio, USA. 7Germline High Risk Cancer Focus Group, Case Comprehensive Cancer Center, Case Western Reserve University, Cleveland, Ohio, USA. Address correspondence to: Charis Eng, Cleveland Clinic Genomic Medicine Institute, 9500 Euclid Avenue NE50, Cleveland, Ohio 44195, USA. Phone: 216.444.3440; Email: engc@ccf.org. J Clin Invest. 2019;129(2):452–464. https://doi.org/10.1172/JCI121277. 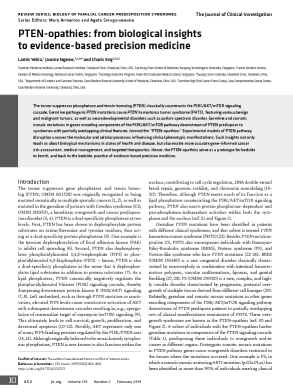 The tumor suppressor phosphatase and tensin homolog (PTEN) classically counteracts the PI3K/AKT/mTOR signaling cascade. Germline pathogenic PTEN mutations cause PTEN hamartoma tumor syndrome (PHTS), featuring various benign and malignant tumors, as well as neurodevelopmental disorders such as autism spectrum disorder. Germline and somatic mosaic mutations in genes encoding components of the PI3K/AKT/mTOR pathway downstream of PTEN predispose to syndromes with partially overlapping clinical features, termed the “PTEN-opathies.” Experimental models of PTEN pathway disruption uncover the molecular and cellular processes influencing clinical phenotypic manifestations. Such insights not only teach us about biological mechanisms in states of health and disease, but also enable more accurate gene-informed cancer risk assessment, medical management, and targeted therapeutics. Hence, the PTEN-opathies serve as a prototype for bedside to bench, and back to the bedside, practice of evidence-based precision medicine.